Get this PUMA sneakers now available at DOT! Heading into the Fall in style, Global sports brand PUMA releases the Cali in a brand-new colourway for women. Keeping the sneaker game on point, the sport-inspired classic returns to the streets with a timeless monochrome makeover. Channelling west coast vibes this season, the effortlessly chic platformis a nod to the Golden State’s summery nostalgia. The signature low top silhouette is reimagined with a contemporary appeal. Available in a clean white & black colorway, the sneakers are decked with a perforated vamp and a leather upper inspired by the original PUMA California. With a lace closure system, the contrast pop on the progressive rubber tooling gives it the much-needed edge. 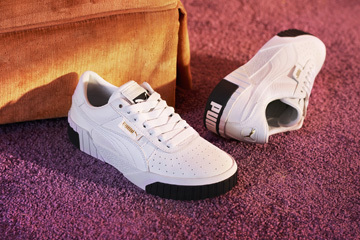 Foil PUMA branding on the lateral tab and heel for a premium touch, the latest iteration is a certified street style.